Remove your spa cover with ease. The CoverMate I only has one moving part and built-in stop mechanism so installation is simple and fast. The CoverMate I is a manual lift and has proven to be absolutely trouble-free. Only 10" (25 cm) or more clearance behind the hot tub is needed. 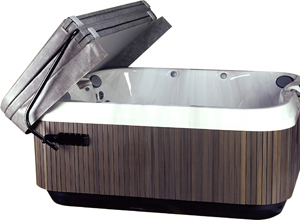 Fits up to 8' (2.4 m) spas.